Is your Joomla website not performing well in the search engines? If yes, it’s time to optimize it for search engines. We have professionals team to provide result oriented SEO services for Joomla website. Joomla websites have comprised around 30 million of the websites on the Internet today. Joomla is a very versatile CMS with having the ability to meet all kinds of needs. If you have a Joomla Website, then you will be very happy to know that websites done in Joomla are well capable for Online marketing campaigns. But, it needs a lot of modifications to make it capable of better Internet marketing campaigns and search engine friendly. Why Choose Outshine Solutions Joomla SEO Services? 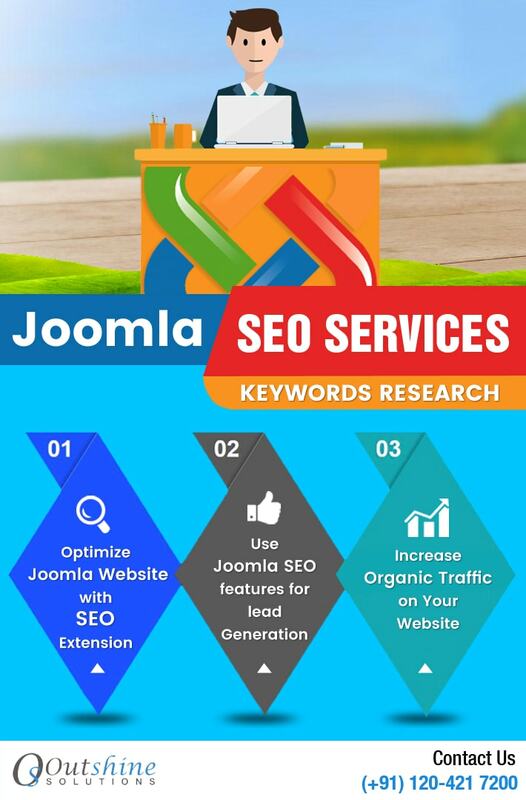 With our Joomla SEO Solutions, we can take your business and websites to the next level by using our progressive Joomla SEO techniques and tools. Our years of experience with smart Joomla SEO tactics and a clear understanding of your business, we can get the ranking and website traffic you need to grow your business. We have helped many businesses & achieve top rankings on Google in other search engines including Yahoo, and Bing for the highly competitive keywords. We offer all kinds of service such as keyword research, Onsite & offsite optimization, social media marketing, link building, article & blog marketing, etc. We ensure you rank higher on major search engines and achieve good visibility. The initial stage of project allotment we prepare SEO Audit to measure website status including current SEO rankings, meta tags, headings tags, sitemap, robots.txt, Alexa rank, duplicate content, hosting configuration, website page load speed, code quality, search engine friendly URLs and more. Our Joomla professionals can help your business make money, help with website search engine optimization, advertising and promotion. We have different SEO Packages for organizations and ease to choose one for your business size. Our priority is to give our customers the most satisfactory experience with our Joomla SEO services. So, if you have got a Joomla website and want to get proper visibility and ranking online, then feel free to contact us.